Corynispa Uhmann 1937e: 337 Nomen nudum. Head: medial sulcus absent; vertex alutaceous, with depression between eyes; carina present from depression to antennal base. Antenna: with 7‑antennomeres; antennomere 1 subglobose, 2 transverse, 3 cylindrical; 4 to 6 transverse, 7 2x as wide as the preceding. Pronotum: longer than wide, parallel‑sided; with scattered large punctures; two areas on either side of disc with dense punctures. Elytron: lateral and apical margins dentate; dilated at apex; with 10 rows of punctures; costae carinate, especially on basal 1/5; costa 2 highly carinate at humerus, continues on basal ½, more elevated at apex. Leg: thickened; tarsal claws with tooth at base. 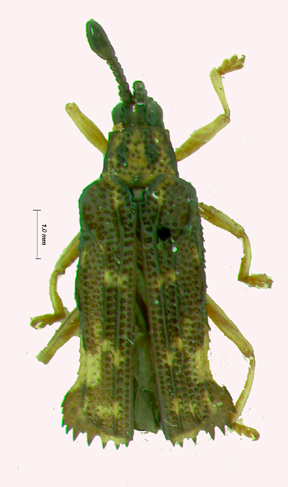 Described species: 1- Corynispa clavicornis (Uhmann) (Staines 2012). Uhmann, E. 1937e. Übersicht über die ersten Gattungen der Uroplatini (Col. Chrys.). (67. Beitrag zur Kenntnis der Hispinen). Entomologische Blätter 33:336-337. Uhmann, E. 1940e. Die Genotypen der von mir aufgestellten Hispinen-Gattung. 88. Beitrag zur Kenntnis der Hispinen (Col. Chrys.). Entomologisk Tidskrift 61:143-144.